Bring a bit of the simple rustic countryside into your modern kitchen with these rustic vintage style salt and pepper shakers. My kitchen has a small rustic corner reminding me of the countryside and the charmingly simple rustic pleasures available there. These would make lovely wedding gifts, housewarming gifts, rustic retro Christmas gifts, retro gifts for farmers or retro lovers. The rustic old fashioned country look salt and pepper shaker set would make a lovely table centerpiece as well. It would fit into any retro rustic kitchen decorations. Individually handcrafted from cold cast resin, the farmer and his green rustic truck sure does remind me of the farmers market and the various fresh farm produce. The farmer shaker set measures 7 3/4″ x 3 1/2″ x 4 3/4″. Without the glass shakers, it measures 3 3/8″ high. This would make a lovely housewarming gift too. What could be more rustic and country side feel than a family of roosters running in the farm. This farm rooster salt and pepper shaker holder is handcrafted from cold cast resin. The glass salt and pepper shakers sit in old style country feed buckets or milk pails with the colorful rooster standing guard. With bright colored sunflowers and cute yellow chicks, this sure does bring some cheerfulness into the kitchen. Rustic faux wood signs point in the direction of the respective shakers. This package includes the richly detailed shaker holder in vibrant colors together with the 2 glass shakers. Spices are not included. 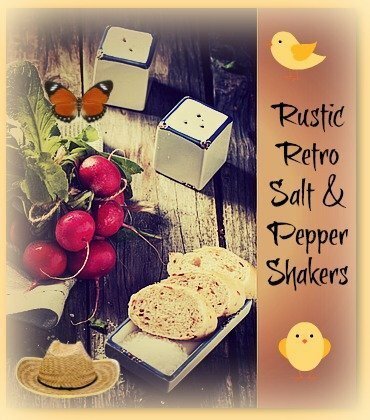 This rustic country hen shaker set measures 6 1/2″ x 4 1/8″ x 7″ high. Anyone who is into rooster collection would love this. The whole set includes 2 ceramic jars and a decorative chicken wire basket. The basket measures about 4-5/8″W x 2-1/8″D x 1-3/4″H with the jars about 3 1/8″ in height. This cute vintage mason jar salt and pepper set would make a lovely and useful vintage inspired housewarming gift. The water pump makes me think of those long ago days when one has to push the pump to get water. Now all I have to do is just turn on the tap. The pump pump, rooster, chick as well as the 2 water buckets and the base are individually hand-crafted from cold cast resin. The salt and pepper shakers are made of clear glass with metal caps. Spices are not included. The set measures 6″ x 4″ x 7″ high and weighs 1.4 pounds. This adorable mother hen water pump salt and pepper shaker set would certainly add some old fashioned rustic cheer to your dining table. A farm tractor pulling a wagon is a common country side farm scene. The vintage style tractor and wagon are individually hand-crafted from poly resin. The 2 shakers are made of glass with metal screw-on lids. Spices are not included. The vintage style farm tractor salt and pepper shaker set measures 5″ H x 9″ W x 3.5″ D. It weighs 1.3 pounds. The milk crate, the cows and the farm are typical country side charm. This vintage inspired salt and pepper shaker holder comes with wooden handle. The 2 clear glass shakers are also included. The shaker set measures 4″L x 2.25″D x 4.75″H. The vintage milk crate has such a rustic retro vintage feel to it and would be great for any retro themed kitchen. The chicken wire holder reminds me of the chicken wire basket that my grandma used to hold her fresh eggs. This holder comes with chicken wire on all sides and measures 4″ wide, 2″ deep, and 3″ tall without the glass shakers. The glass shakers are included with the set. This chicken wire set would fit into any rustic vintage style kitchen decor. These are lovely rustic retro salt and pepper shaker sets. If you love the countryside, the farms and fresh air, then you’ll love these shakers with their rustic holders. If you’re looking for unique Christmas gifts, retro gifts or gifts for farmers, then these would fit the bill.